Data Science is all the rage. Career interest has surged, programs are offered at more and more universities, and every company is talking about needing it. But do you? How do you know, and when would you hire one? These are questions that get glossed over in the race to be smarter. Data Science is a powerful tool - it can unlock understanding in data, which leads to new insights no one considered. However, often the most practical insights arrive as a result of Data Mining and posing the right questions. At the latest MSMR conference at UT Arlington, the keynote presentation “Behind the Corporate Curtain” by Simon Chadwick talked about where corporate research spending was headed in the next five years. The top two items of incremental focus, above CX and Digital, was Data Analytics and Data Mining, plus integrating multiple data streams. Data Analytics – working with the business to describe, predict and improve business performance through data. Broad subject that includes many tools and techniques. Data Mining – examining large data sets to generate new information or insights. A tool of analytics used to dig in, clean up, and see what nuggets there are in the data. Data Science – applying statistical methods to data to generate new information or insights. A tool of analytics used to apply a specific technique to generate a specific result. Remember that finding that got Target all the press a few years back, where they could predict when a girl was pregnant before her father knew? That was heralded as a slick data science discovery, but it wasn’t, it was just good ‘ole fashioned data mining. Finding that right pebble on the beach. Target had conducted a study to understand what major life events force a break in normal shopping routines, opportunities to capture new customers. One of the more interesting ones was getting pregnant. Around the same time, they were pulling all their shopper and sales data into one spot to allow them to track purchases by customer. Then, someone asked the following: “what products does someone, who we eventually realize is pregnant, purchase in the early stages of pregnancy?” If Target could get them in the door early, they would likely stick with the store for all their later needs. After just identifying those customers and walking backwards through their shopping data to look for patterns, the answer was not baby gear, it was unscented lotions. A client that I was working with told me recently, “I can bring in a statistician, but I think I’d also have to hire someone to accompany them to talk to the business user. They know the mechanics, but wouldn’t be able have a meaningful segmentation discussion.” These are wise words from a leader who is trying to bring advanced capability to an organization. A more inexperienced leader would hire a small army of statisticians and hope the “build it and they will come” strategy pays off. It typically doesn’t. Capital One is a company that jumps to mind often as a leader in data science. They employ an army of statisticians, and consider how they analyze data to be a completive advantage. There is a famous Harvard Business School case study on them that explains this, but also more importantly, describes a business process that they followed early on, which allowed them to gain share quickly before their competition could react: testing and innovation. They were relentless in conducting market testing for different offers and products, targeted to groups of people that they thought might respond. Yes, there was data science behind the segmentation and prediction that helped shape the hypothesis, but the sheer volume of testing, measuring and validating was what set them apart. They were throwing a hundred pieces of spaghetti on the wall and seeing which 5 would stick, then aggressively going after those ideas before their competition could react. They used data science as a methodology, but their business model described in that moment of their history was to outsprint, not outsmart. The statistical analysis of Data Science is a powerful tool, and well deserves its place in the toolbox of any company doing advanced analytics. But advanced comes after intermediate, and when an intermediate company tries to follow a “me-too” advanced strategy, it is ignoring the value of what intermediate data mining can bring. All too often this wastes valuable time for a company, trying to be something they aren’t…yet. Data science is part of a mature progression of data capability, formed from having as a clear sense of how it can successfully integrate into a business process before the first study is conducted. I recently made the leap from the corporate side. After 15 years of helping people understand and solve problems with their data, I decided that my profession would be more enjoyable as a consultant, where I would be able to see a wider variety of challenging work. That’s certainly been the case! Like a lot of people, I’m amazed at how the data world has grown. The amount of data and the tools available are impressive. I wish that I had some of these tools available to me when I started my journey, but then again, I wonder how much of that would have mattered. Like a photographer who gets better through the process of just shooting more pictures, a data person gets better by just analyzing data – whether it’s on a spreadsheet or a sophisticated analytical platform. Which brings to another theme I’ve seen in my 15 years, and has recently gotten worse: people forget the power of simple data. It’s a syndrome that’s common and has blown up with the increase in data and tools. Many organizations rush to gather as much as they can and purchase tools to understand it - afraid they will not be competitive without it. What’s more likely than not, though, is that they wind up with mismatched pieces or tools that don’t play well with each other. 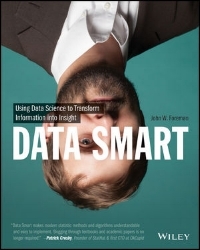 I’m reminded of the book Data Smart, that walks the reader through the basics of data science through follow-along exercises in Excel. By doing that, you understand the data at it’s lowest level, and get what the statistical method is doing far better than if you had used a sophisticated drag-and-drop software. Great read. Another great read on that topic is Data Science for Business, which does an excellent job of explaining the “so what” and “why does it matter” behind different statistical methodologies. What you method you choose to follow shapes whether or not you’re going to get a result that means anything. In thinking back on it, my whole data career has been around getting people past this, creating things that are simple and actionable and move them forward quickly. It’s not just a technical exercise. Like qualitative marketing research, the approach that’s used makes all the difference. “Garbage in, garbage out” is often what got people to that place to start with, so empathizing and getting to the right question is a necessary first step. Take customer experience for example. There are a lot of great tools out there, from Qualtrics to Medallia, and more and more companies have staff dedicated to CX. However, what most of them can’t answer is “what effect will this campaign have’, or “what is the value of converting a passive to a promoter’? They are not getting at the “so what” behind the data, because they are relying on the system-fed metrics that their platform provides. Getting past that involves the right mix of business and technical know-how. One without the other produces limited results. Would you like to know more about what ABRG can do to help? Read this paper on our capabilities and case studies.